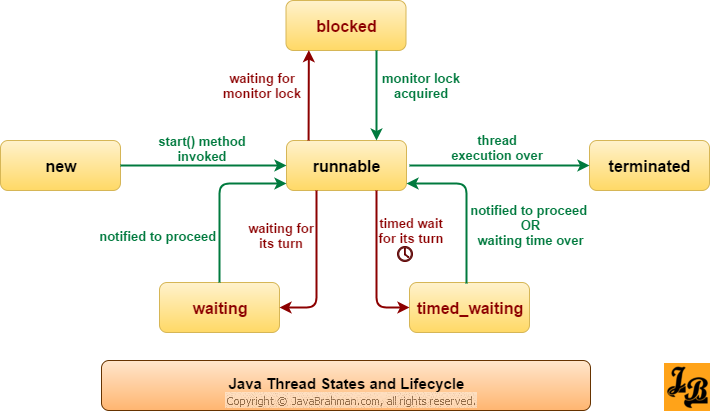 This tutorial explains thread life cycle in Java with examples. This is the second article in the Java Concurrency Series, with the first articleClick to Read tutorial on Java MultiThreading Basics & How-to create/run Threads covering basics of multithreading in Java. In this tutorial we will start by looking at the Java thread lifecycle diagram. We will then look at individual thread states in detail to understand the state information they encapsulate and how transitions happen between these states. Lastly, we will take a look at a code example showing how a thread moves through its states, understand the logic of the program via a sequence diagram and then understand how the code works. New – A newly created thread object instance on which the start() method has not yet been invoked is in the new state. To learn how to instantiate threads in the proper way check out this tutorialClick to Read tutorial explaining how to create a Thread in Java. Although the thread enters the runnable state immediately on invoking the start() method, but it is not necessary that the thread immediately starts executing. A thread runs when the logic it holds in its run() method can be executed by the processor. In case the thread logic needs any resource which is not available then the thread waits for the resource to become available. Secondly, a thread in runnable state may run for some time and then get blocked for a monitor lock, or enter the waiting/timed_waiting states as it waits for the opportunity/time to enter runnable state again. Blocked – A running thread may enter the blocked state as it waits for a monitor lock to be freed. It may also be blocked as it waits to reenter a monitor lock after being asked to wait using the Thread.wait() method. Thread waiting due to Thread.wait() method being called on it: The other thread can use Thread.notify() or Thread.notifyAll() to give the go-ahead to the waiting thread. Thread waiting as it itself has asked for joining another thread using Thread.join(): The waiting thread gets a go-ahead when the thread its waiting for ends. Thread waiting due to LockSupport.park()method being invoked on it: The waiting thread resumes when LockSupport.unPark() is called with the parked thread object as the parameter. Thread made to wait using Thread.sleep() method. Threads being asked to wait for a permit for a specified amount of time using LockSuport.parkNanos() and LockSupport.parkUntil() methods. Threads being made to wait for a fixed amount of time using Thread.wait(long millis) or Thread.join(long millis, int nanos). Terminated – A thread enters its ‘final resting’ state or terminated state when it has finished executing the logic specified in its run() method. The Java example below shows how a typical thread moves through the various life cycle states. A sequence diagram showing interaction between threads and detailed explanation of the code follows. ThreadStates.java is the class with the main() method in above example. It instantiates a BasicThread.java instance, named threadInstance,and then calls start() on threadInstance to start the execution of parallel thread. The state of BasicThread is printed at this point as RUNNABLE. ThreadStates then gets into an infinite while loop with a boolean flag variable named keepRunning. At the beginning of the loop the thread goes to sleep for 2000 milliseconds or 2 seconds. At the same time BasicThread too goes to sleep for 5000 milliseconds. In every iteration of while loop, at a gap of every 2 seconds, BasicThread’s state is printed. During 1st iteration(2 seconds) and 2nd iteration(4 seconds) elapsed times – BasicThread is printed as being in state TIMED_WAITING as it is sleeping for 5 seconds. When 5 seconds elapse BasicThread wakes up, and it immediately asks itself to wait using Thread.wait() method. The state of BasicThread is printed at this point as WAITING. Then, in 3rd iteration i.e. when 6 seconds elapse, ThreadStates invokes notify() on BasicThread which then starts executing. In 4th iteration(8 seconds) ThreadStates checks for BasicThread’s state. The state is now TERMINATED. The flag keepRunning is now set to false. ThreadStates exits the while loop and ends its processing. 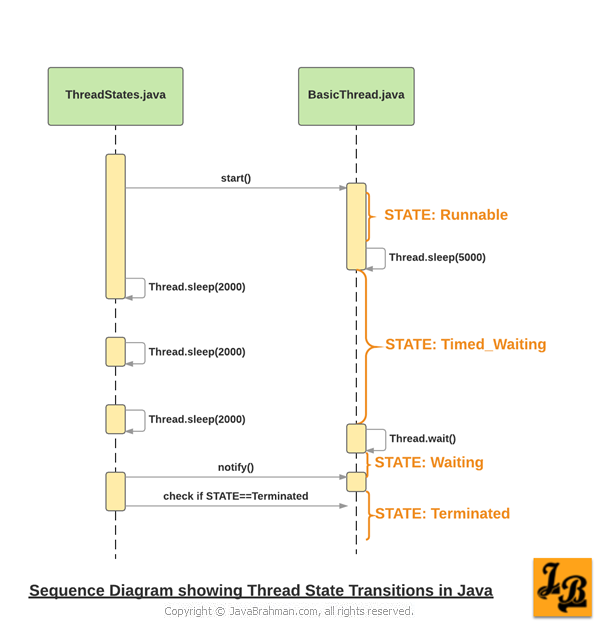 In the above tutorial, 2nd in the Java Concurrency Series, we understood the lifecycle of a thread, looked at different thread states, and saw how a thread moves through the different states during its life. In the next tutorial in this series we will take a look at the thread characteristics and how they can used to control the execution of threads as required. Previous PostWhat’s new in latest version of Android Operating System – Android ONext PostNode.js How to resolve error An exception occurred while executing watcher ‘Pug/Jade’. Watcher has been disabled.